Penhaligon’s will launch Clandestine Clara and Roaring Radcliff, two new fragrances in Chapter 2 of the Portraits collection, in February. Clandestine Clara ~ peacock; the mistress of Lord George. An oriental with amber, patchouli and cinnamon. Roaring Radcliff ~ lion; possibly the illegitimate son of Lord George. With spices, rum and tobacco. Update: Clandestine Clara was developed by perfumer Sophie Labbé, and additional notes include vanilla rum. Roaring Radcliff was developed by perfumer Daphné Bugey. Exactly. When niche perfume is piggybacking on Downton Abbey as their marketing scheme, the idea of niche as “artisanal” is suspect at best. Coming back to say, though, that while most of us think of Penhaligon’s as niche, they are not really the sort of brand that came into being as a “reaction” or alternative to the blah-ness of mainstream perfumery. They are a “traditional” small brand, and while they have at times flirted with the edges of what we think of as niche perfumery, it’s not really their remit IMHO. 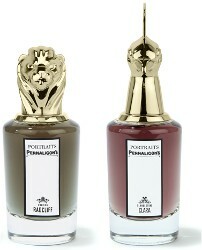 Their classic perfumes, things like Bluebell and Artemisia, were more charming than challenging. Considering how it is marketed and where it is sold, I’d say Penhaligon’s is at least aspiring to be “niche.” But I like your word “artisanal” even more. I think they are aspiring too, but just saying they are not, to me, the same as a brand like (old) Diptyque or (old) L’Artisan, which came from a different place. Penhaligon’s is more like Floris, or Guerlain for that matter — they all started as traditional toiletries brands, at a time when there was no “mainstream” perfumery to react to, as it were. I think you can fit this line as an exclusive collection of a mainstream brand. Tough, honestly, at this moment this division of niche, exclusive and mainstream is lately more a matter of price and bling instead of positioning and essence. Agree, it is no longer a meaningful distinction, and it’s not for nothing that many niche brands no longer want to be called niche. I can hardly wait. On second thoughts, yes I can. To me Penhalogions is just a mall outlet, trading on a particular version of Englishness that I find lazy and tiresome. It’s the Daily Mail in perfume form.